Park Forest, IL–(ENEWSPF)– The Village of Park Forest Board’s next Neighborhood Meeting is scheduled for 7 p.m. on Thursday, July 9 at Hope Lutheran Church, 424 Indianwood Boulevard. Invited residents will be those living south of Sauk Trail, west of Indianwood and north of the Will County line. Letters of invitations have been mailed out to residents in this part of the community. In an effort to improve communication with citizens, the Village of Park Forest implemented the Neighborhood Meeting Program in 2004. Since then, Village Officials have facilitated meetings in all neighborhoods across the community, and in most cases, have been into each neighborhood twice since the inception of the program. The meetings are held with the intent to provide residents with an opportunity to have their voices heard and questions answered by the Mayor, Village Trustees, Village Manager, Department Heads, and other members of the Village Staff. 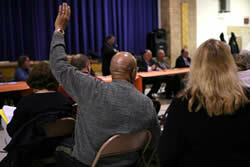 Typically, the meetings draw 50 to 100 citizens and in some cases, the attendance has been upward of 200 residents. Questions regarding the Neighborhood Meeting Program can be directed to the Village Manager’s Office at 708-748-1129.